In the new study, research lead by the laboratories of Berkeley bioengineering professors Niren Murthy and Irina Conboy demonstrated that their novel approach, called CRISPR-Gold because gold nanoparticles are a key component, can deliver Cas9 - the protein that binds and cuts DNA - along with guide RNA and donor DNA into the cells of a living organism to fix a gene mutation. "CRISPR-Gold is the first example of a delivery vehicle that can deliver all of the CRISPR components needed to correct gene mutations, without the use of viruses," Murthy said. To overcome these challenges, the Berkeley scientists invented a delivery vessel that binds all of these components together, and then releases them when the vessel is inside a wide variety of cell types, triggering homology directed repair. 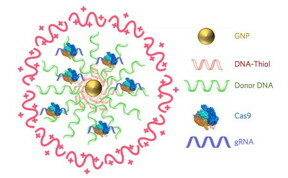 CRISPR-Gold's gold nanoparticles coat the donor DNA and also bind Cas9. When injected into mice, their cells recognize a marker in CRISPR-Gold and then import the delivery vessel. Then, through a series of cellular mechanisms, CRISPR-Gold is released into the cells' cytoplasm and breaks apart, rapidly releasing Cas9 and donor DNA. CRISPR-Gold was also able to reduce tissue fibrosis - the hallmark of diseases where muscles do not function properly - and enhanced strength and agility in mice with Duchenne muscular dystrophy. CRISPR-Gold-treated mice showed a two-fold increase in hanging time in a common test for mouse strength and agility, compared to mice injected with a control. "These experiments suggest that it will be possible to develop non-viral CRISPR therapeutics that can safely correct gene mutations, via the process of homology-directed repair, by simply developing nanoparticles that can simultaneously encapsulate all of the CRISPR components," Murthy said. The study found that CRISPR-Gold's approach to Cas9 protein delivery is safer than viral delivery of CRISPR, which, in addition to toxicity, amplifies the side effects of Cas9 through continuous expression of this DNA-cutting enzyme. When the research team tested CRISPR-Gold's gene-editing capability in mice, they found that CRISPR-Gold efficiently corrected the DNA mutation that causes Duchenne muscular dystrophy, with minimal collateral DNA damage. The researchers quantified CRISPR-Gold's off-target DNA damage and found damage levels similar to that of a typical DNA sequencing error in a typical cell that was not exposed to CRISPR (0.005 - 0.2 percent). To test for possible immunogenicity, the blood stream cytokine profiles of mice were analyzed 24 hours and two weeks after the CRISPR-Gold injection. CRISPR-Gold did not cause an acute up-regulation of inflammatory cytokines in plasma, after multiple injections, or weight loss, suggesting that CRISPR-Gold can be used multiple times safely, and that it has a high therapeutic window for gene editing in muscle tissue. "CRISPR-Gold and, more broadly, CRISPR-nanoparticles open a new way for safer, accurately controlled delivery of gene-editing tools," Conboy said. "Ultimately, these techniques could be developed into a new medicine for Duchenne muscular dystrophy and a number of other genetic diseases." "Genetic diseases cause devastating levels of mortality and morbidity, and new strategies for treating them are greatly needed," Murthy said. "CRISPR-Gold was able to correct disease-causing gene mutations in vivo, via the non-viral delivery of Cas9 protein, guide RNA and donor DNA, and therefore has the potential to develop into a therapeutic for treating genetic diseases." The study was funded by the National Institutes of Health, the W.M. Keck Foundation, the Moore Foundation, the Li Ka Shing Foundation, Calico, Packer, Roger's and SENS, and the Center of Innovation (COI) Program of the Japan Science and Technology Agency.